Sue and I have always kept a pretty full plates. The drive to make the assorted projects, events and time tables work results in an constant sense of urgency. Now that I am wrapping up most of major projects I wanted to complete, I trying to slow down and to make time for some of the details that never get addresses. We really haven’t changed the yard and landscaping since we moved in. 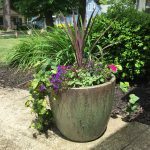 But this spring, in addition to replacing the daylilies along the front sidewalk, with the help of Barnes Nursery, I added a few details to our home’s appearance. 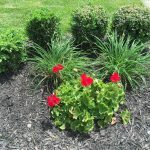 I added geraniums to the the flower beds at the entrance to sidewalk leading to our front door. The color really helped to the define the the entrance. I also wanted to add something to the approach to the front porch. I made several trips to various stores looking for the perfect flower pots, but I didn’t have a vision for what I was looking for. It was one of those things where you don’t know what you want, but you’ll know it when you see it. Barnes Nursery has huge selection of pot, so trying to visualize which one will look best wasn’t easy. Then there is the question what size will look best. Sharon Barnes suggested that I take a few home to try out and to bring back the ones I didn’t want. It was something I would have been comfortable doing if she hadn’t suggested it. I finally decide on the ones I wanted to try, but as I was about to leave, I saw the perfect ceramic flower pots. They were handmade and had an earthy appearance. Sharon helped me select and layout the flowers. The look and the plan finally came together. They were just what I was looking for. 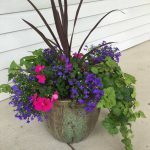 I liked the look so much, I went back the next day to another pair of the same pots for the side porch.